Finally, I can share my dosa tips and tricks with you! It is so very simple once you learn how and how not. Let me know how it goes for you and if you have any questions. - water to cover in blender for mixing the batter. 1. Soak the split mung dahl and the rice in water separately for 4 - 8 hours. 2. When soaking is done, drain and gently wash the mung and rice. 3. Combine the mung, rice, salt, optional spices and ghee in a blender. Fill up with water so it just covers the ingredients. I used fresh mint this time. 4. Blend thoroughly to a thin batter. If it's too thick the dosas will stick to the pan and not cook all the way through. 6. 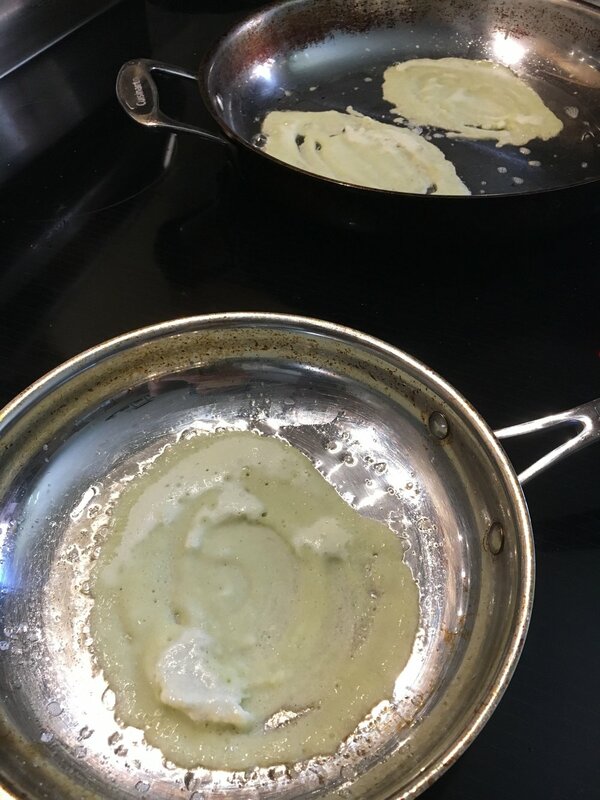 When the skillet is hot, poor in a small amount of batter and spred it as thin as you can, cook until the top of the dosa isn't liquid anymore. 7. Carefully flip it over with your spatula and cook on the other side. 8. When both sides have a golden shime to them, pop out the dosa. The trick is to not put too much ghee in the pot, as the heat will then be used to cook the ghee, not the batter... When the pan is getting dry, only put in a few more drops of ghee. Experiment and see how much you need for your pan.